MOMOs are our go-to snack. It’s cheap, easily available and yummy. What more do you want? Here are some of the most delicious momo serving places in our list. In no particular order, these places should be visited at least once for mouthfuls of juicy MOMOs. The MOMOs at Dharara are so delicious you will happily come back for more. They add peanuts to the usual ingredients which elevates the taste of the MOMOs. The service is quick- they grab a tapari, scoop a dollop of sauce over the MOMOs, poke a toothpick in the momo and push it over to you. The vegetarian MOMOs are especially popular. We only wish they’d give us spoons so that we could scoop up the last bits of the sauce. Have you tried the paneer MOMOs at Bagmati Sweets yet? The MOMOs, in the small shop in Tripureshwar, are stuffed with a good helping of paneer and are delicious by themselves. But when you add the tomato achar which is quickly absorbed by the MOMOs, then your taste buds will truly rejoice. Both the MOMOs and the achar are served fresh and the achar (which is kept in a bottle and is just the right amount of hot) reminds you of the ones your mother makes at home. Be sure to visit the small shop between 11:30 AM and 2 PM- anytime before or after will leave you disappointed. 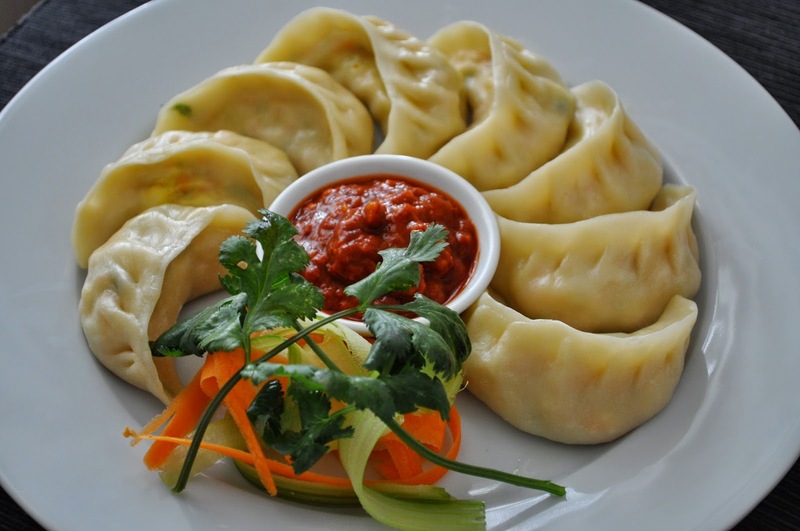 The open MOMOs at The Ghangri Café in Jhamsikhel are famous. They’re served with three kinds of chutneys, including peanut and mint chutneys. Instead of folding the MOMOs the regular way, they fold it partially so your fillings are visible in four compartments. You can drip the chutneys over the fillings and savor the delicious chaos brought by the different flavors. Something new for momo lovers to try would be the pasta MOMOs at The Societe Lounge Bar in Hattisar. The pasta momo brings you the best of both worlds- momo and pasta together. You are served a plate of MOMOs covered in pasta. Take a spoonful of momo and pasta, the combination of which is simply luscious. Best while eaten hot, you can opt to add chutney or tomato ketchup to your plate. Don’t you just love momo platters? There are fried, steamed, kothey and chilli MOMOs in one plate. Yummy! The momo platter at Royal Saino in Durbar Marg is particularly a favorite of many people. With a total of fourteen pieces, you can eat your fill of the MOMOs. Go for the vegetarian platter. They have garlic cheese chilli, mushroom and peanut paneer fillings. Poleko momo. Now that’s something new for us. The golden brown MOMOs are crispy and not oily at all like the deep fried ones. Available at Indreni Food Land in New Baneshwar, try this for a new momo experience. If you’re looking for quick service and tasty MOMOs around Basantapur, make a beeline for Shandar Momo. Opposite Suraj Arcade, the small shop is your typical galli ko momo pasal. As it offers no seating arrangement, you better take the tapari full of warm MOMOs, choose from either one of the sauces (or mix both) and eat it standing up. Fill the tapari to the brim with the sauce and gobble away. The Jhol MOMOs at GG Machaan are ideal for winter evenings. The tangy soup that smells of coriander and has a slight flavor of peanuts is the perfect companion for dumplings cooked to perfection. Available in vegetarian, buff and chicken, these MOMOs will cater to any kind of taste palate. You can also ask the waiters to make it a little spicy (or not) according to your preference. Momo Magic is a favorite momo haunt for many people. Loyal customers go back to the restaurant in Mahargunj again and again. If you haven’t been to the place for a while now, gather your friends for a reunion with the MOMOs. The succulent MOMOs will be waiting for you along with the hot chutney. A variety of MOMOs are served at Momo Mantra. There’s cheese MOMOs, Thakali style mutton MOMOs and pork MOMOs, apart from the regular chicken and buff MOMOs. There are two branches- Mid Baneshwar and Kamaladi- so drop in to any one place and try out their MOMOs.